Natural Insect Repellents such as Soy Oil Plus Mosquito repellent recipe! Natural Insect repellents such as soy oil, and do it yourself mosquito repellent recipe are much more natural and healthy than Deet, a nasty neurotoxin. Learn great alternatives to chemical bug repellents. Pesky biting bugs! We will do anything to try and stop them from biting. Learn what attracts mosquitos and other biting insect, plus different options you have for bug repellent- from chemical sprays to natural products, and make-your own. Find out about all different biting bugs- from mosquitos to ticks. Many bugs are vectors for diseases such as lyme disease, west nile and more, as diseases spread around the world. So, you want to find out about…. Generally, in the wild, mosquitos are attracted to large animals such as moose, so mosquitos have adapted to be able to easily detect these large, heavy breathing sweaty animals. These are the same things that attract mosquitos to people. · Carbon Dioxide (CO2). When you breath out, your body produces carbon dioxide. · Lactic acid. When you exercise, you produce lactic acid. · Sweat- mosquitos are attracted to the chemicals that we release when we sweat. Plus they are attracted to water and moisture. · Dark clothing also attracts mosquitos - you are the same colour as a moose or a bear. · Sweet smelling fragrances - Try not to wear perfume, fragrant body lotions or scented sunscreens. Also, fragrances in your laundry from softeners and dryer sheets need to be noted. Wash your camping clothes with unscented laundry detergent. And, if you can handle it, before heading into the woods do not wear a lot of perfumes. Use unscented soaps. Spray the clothes you will be wearing with natural insect repellents. So you do not have to spray the bug repellent directly on your skin. Before going into the woods use natural based soap with the essential oils below. Or use non-scented soap. Wear light weight long sleeved clothes. Go inside or near a fire around and after dusk. Do not camp near a swamp or standing water. 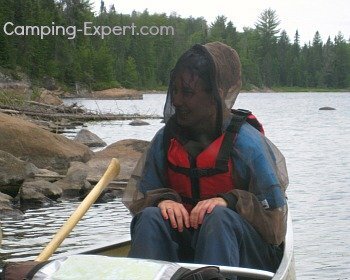 Use a bug mesh hat, or a bug jacket. Check out my page on Deet insect repellent and learn why natural insect repellents are better for your health. Is as effective as 7 and 15% DEET and protects for 2 hours. Greater concentrations of DEET proved to be longer lasting than Repel. This is the best alternative to DEET - a great alternative for kids, or health conscious people. Some people are critical of the smell. This is the best natural alternative to DEET, however is not fully natural as it contains an inactive synthetic ingredient. Soybean oil is more effective against mosquitos as 7% DEET, but not as effective as 15% DEET. Protects for 1.5-3.5 hours. This is the only ALL natural bug repellent that has had studies which proved that it was comparable and has the same amount of protection as the lowest level of DEET. - Is often used in candles and incense. It is more effective than sitting in the open. However it is far from perfect, but does help..
- Citronella does work as a natural repellent, however it is not as effective as DEET, but it can be balanced by repeated applications. - I have used citronella as a bug repellent. Citronella does deter mosquitos, however it has to be applied often, and you will end up smelling like an orange. It needs to be applied often in order to be effective. There are other Natural Oils and materials that have preliminary studies are being done on. All of these oils need to be diluted before applying to skin. Fennel Essential Oil. - Effective at concentrations of 5-8%. Clove Essential Oil. – Effective when undiluted, but should be diluted before applied to skin. More studies need to be done on this essential oil. Thyme Essential Oil. – the smell is very strong and irritating at concentrations above 25%. It is best not to try and make it at home. Celery Extract - preliminary studies have found that it was comparable to 25% deet bug sprays. Neem Oil – contains insecticidal compounds called azadirachtins. Vitamin B-1 people use this to repel mosquitos, but studies have not found this to be true. Garlic- a common theory is that eating garlic (or even Garlic Capsules - I know someone who ate garlic pills, and her sweat smelled like garlic). Early studies have not proven that one ingestion of garlic is not effective. Perhaps more garlic consumption could be more effective. More studies need to be done. All essential oils are safe if applied to the skin, but should not be ingested as they are highly toxic. Mud- cover your skin with mud. Some people suggest eating Garlic, Black pepper and rubbing raw onion on yourself. Another suggestion is oil or grease. The insects come, but can’t bite, and end up drowning in the oil. Remember to wear sunscreen underneath. Some of these essential oils have been studied as insect repellents, but there are discrepancies on the effectiveness of these oils. One of the reasons that these natural products have not been studied extensively is that testing to be labeled by the EPA (Environmental Protection Agency) is expensive and includes testing on live animals. Often, the people that are interested in natural insect repellents are less willing to and financially unable afford such extensive testing. Plus, natural oils are not patented, so other people could use the same product. This does not mean that they do not work against insects, they just may not work as well as toxic DEET because they are less toxic. Insects are smart and seem to be able to tell the difference between poison and something that smells bad. They will keep away from something that smells bad, but further away from poison. Smell very bad to an insect, instead of smelling like a walking toxic fume. Combine all ingredients in a small 4 oz spray bottle. Before using, shake the bottle contents (oil separates from the witch hazel). Now, dilute the above mixture. For your body: add base mixture to 2 cups jo joba or almond oil. Mix well. Insect repellent spay use 2 cups vodka to base mixture. Put into spray bottle. Mix well before use. These are healthier bug sprays than DEET. Who wants to spray a deadly neurotoxin on themselves? Learn more about DEET. The natural bug repellents need to be applied more often, but are not harmful to your health. Go camping and be healthy! Apparently many studies said it only gave 10 minutes of protection. What about Ultra Sonic Electronic Devices? Studies show that these don’t work. Bug Off Synergy Oil Blend.